Despite the Swedish composer, Kurt Atterberg, attesting that his influences were Brahms, Reger and the Romantic Russian composers, the first thing that hits you when you play this CD is how generically English the opening of the Op. 11 Quartet sounds. Atterberg was born in Gothenburg in December 1887, the son of an engineer. He would study electrical engineering before devoting himself to music. He began to learn to play the cello when he was 15 years old. This was after he attended a concert by the Brussels String Quartet. Their cellist Jacques Gaillard had inspired him to take up the instrument. Within six years he began performing with what is now the Royal Stockholm Philharmonic Orchestra. Atterberg started work on a string quartet when still a teenager. In 1906 he completed a quartet with which he is said to have "tortured his school-fellows". This followed an earlier Fugue for String Quartet onto the fire and was destroyed. The first work on this disc is actually his String Quartet No. 2. This String Quartet Op. 11 was composed in 1916 after his fellow composer, Natanael Berg, had suggested that a group of young composers should all compose a short quartet in response to what they saw as the 'stodgy' works being performed by the Chamber Music Society of Stockholm. This work has been recorded before by the Garaguly Quartet but I have not heard that version (Caprice CAP 21502). The String Quartet Op. 2/Op. 39, as the opus numbers suggest had a troubled beginning. Atterberg composed his Op.2 in 1908, he was not satisfied with the results and later revised the work but he was still not happy and revised the work again for a performance in front of Tor Aulin in 1909. After this performance the quartet laid unpublished and unperformed amongst the composer's papers. His Third String Quartet Op. 39, was composed in 1937 and included a theme from his earliest attempts at composing a quartet. This was also seen as unsatisfactory by the composer who revised the work before its final performance. However this led him to discard the inner movements of the Op. 39 and replace them with those of the Op. 2. The first live performance of the quartet, as performed here, was given in April 1938. The resulting work is incredibly homogenous. You can hardly imagine that nearly thirty years had passed between the composition of the inner movements and the outer. The music of Atterberg performed here is deeply rooted in the Late-Romantic movement. It is strongly melodious and attractive whilst not being modernistic and is akin to his symphonies. For me however, the real interest lies in the only quartet of his near contemporary, Ture Rangström, who though he died at the relatively young age of 62, had achieved the status of one of Sweden's leading composers both of songs and orchestral music. His four symphonies, including the wonderful First, which has the subtitle August Strindberg in memoriam, and his Fourth, which is really a sinfonia concertante for organ and orchestra, show greater variety than those of Atterberg. His music has more emotional content too, and this can be seen in this short single movement work that bears the title Un notturno nella Maniera di E. Th. A. Hoffmann or A Nocturne in E. T. A. Hoffman Style. It contains more passion and variety in its thirteen minutes than in both the Atterberg quartets; this despite having been revised by Atterberg and another composer, Edvin Kallstenius (1881-1967) for publication in 1949 two years after Rangström's death. This self-contained work has, unlike the first of the two Atterbergs, been recorded before and on CPO, when it was included on a disc of the composer's chamber music and played by the excellent Holman Quartet (999 689-2, 1999). If anything I prefer this earlier performance as I feel the Holman Quartet show a greater ability to differentiate between the different episodes. This new account is fine however, and its crisper recorded sound serves the music better than the earlier recording. In fact, I wouldn't want to be without either. I am indebted to CPO for introducing me to the music of many composers. Alongside Reznicek and Röntgen, the two whose symphonic works have given me greatest pleasure are Atterberg and Rangström. 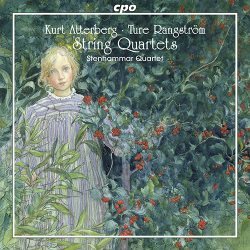 All the more reason to look forward to hearing this disc which contains Atterberg's two 'official' string quartets - there's a Suite and a Variations and Fugue too - and Rangström's only work in the medium. All three pieces prove to be richly rewarding and significant additions to the repertoire. The performances from the Stenhammar are as virtuosic as they are committed. The recording is close and analytical but such is the technical brilliance of the playing that in many ways this serves to underline the intensity and power of both music and interpretations. Atterberg cited the Russian nationalists together with Brahms and Reger as his main inspirations which he sought to fuse with the use of Swedish folk music. As far as these quartets are concerned I would add Schubert as well. Certainly there is a sense that his music is written under the gravitational pull of those influences. So this is clearly 20th century music that is content to be part of the same evolutionary curve as those 19th Century masters. Atterberg was a composer who was comfortable ploughing a consistent compositional furrow through his long life. In part this explains why the longest work here shares two opus numbers and is variously described as both his First and Third String Quartet. In fact it is a fusion of two works; the outer movements dating from 1937 and the inner pair from 1909. That there is not more of a stylistic clash with this music written over a quarter of a century apart could be seen as either coherency or musical inertia. All I can say is that on none of the occasions I listened to this disc did I find there to be any 'jarring' shift. In fact this work has an appealingly balanced form - each of the four movements of near equal length whose structure and form follow traditional quartet writing albeit with a modern(ish) accent. For 1937 this is most certainly not pushing the boundaries of the expressionist capabilities of the string quartet. Alongside the Fourth Quartets of either Zemlinsky or Frank Bridge, which both date from the late 1930s as well - and not exactly arch-modernists themselves - Atterberg's work emerges as powerful, skilfully written and compelling to listen to but far from revolutionary. There is a bracing open-air quality to the music which I find very appealing. From the outset of the Op.11 quartet which opens the disc, the music strides forward, confident and purposeful - even the reflective second subject is calm rather than neurotic and has a modal Vaughan Williams-esque quality [tr. 1 3:40]. The playing of the Stenhammar Quartet is uniformly excellent, brimming with virtuosity but at the same time able to pull dynamics and tone right back to a ghostly whisper. My only concern with any aspect of the disc are the very audible sniffs from the first violin. Listened to at a moderate to low volume this is not distracting but once the volume is increased or even more so over headphones it is very noticeable and for me edges towards distracting. Putting that concern aside, the rest of this disc is pure delight. Recently I found myself strangely dissatisfied with some York Bowen string Quartets from a similar period - not in performance terms but as works. Alongside these Atterberg Quartets, which are written with a real sense of how to exploit the potential of the format, the Bowen are further revealed as music written onto the format rather than for it. The opening of the second movement Andante reinforces the sense that Atterberg understands string writing; a very simple raindrop pizzicato figure accompanies a folkish viola song - beautifully executed here; ghostly and mesmeric. In many ways this is the most interesting movement in the work. The closing Allegro furioso - this is a three movement work - is happy to look back towards nineteenth century precedents and feels less original although still enjoyable. There is nevertheless great pleasure to be taken in the interplay of the part writing and skill of this performance. I like particularly the grinding hurdy-gurdy writing for the cello [tr. 3 4:00] creating long-held pedal-notes as the movement drives to an abrupt conclusion. If Atterberg is famous at all it is for his 'Dollar' Symphony which won a competition to write a contemporary symphony in homage to Schubert. No surprise that the composite Op.2/Op.39 seems more than once to be Schubertian with a twentieth century accent - especially the finale. This is a 'traditional' four movement quartet with the slow movement placed third. It starts, without introduction, with a flowing lyrical theme - if anything exposes that this is one of the 'later' movements it is the understated skill of the contrapuntal writing, Atterberg is content to keep the textures open and clean. For 1937 this might seem like strangely contented and untroubled music but nonetheless likeable for all that. The muted scherzo has Mendelssohnian flickering magic which allows the Stenhammar Quartet to display their exceptional control. Atterberg slips in momentary heavy cross-beat accents which the players dispatch without disturbing the flow. The central 'trio' is Slavic in its gentle melancholy before Mendelssohn returns. The third movement Adagio is jointly titled 'Romance' and has a song-without-words character. I'm not wholly convinced how well the weight of this sits next to the preceding Scherzo although in its own right it's beautifully written. Somehow it feels as though Atterberg is trying just a little too hard to write a 'serious heart-of-the-quartet' movement. He does include some interesting expressive downward glissandi in the parts which would be very novel for 1909. I wonder if that was added in the 1937 completion? The closing Allegro Deciso is a tour de force brilliantly dispatched. Very much written in the spirit of the galloping finale of Schubert's Death and the Maiden; so much so I was very surprised not to read of the similarity in the interesting liner-note. This brings things to a thrilling conclusion. Certainly this is a work I would be very happy to hear live although given its complexity and the unfamiliarity of its composer one suspects that few ensembles will be given the opportunity to devote time to learning it. Thank goodness therefore that the performance we do have here is of the quality that it is. Rangström is in many ways a rougher and less 'polished' composer than Atterberg - which is probably why I like his works. There is volcanic urgency, a sense of an imperative need to write down music that is spilling out of him without the conscious refinement and polish that Atterberg adds. The opening of his sole work for quartet recorded here has a driving, bullish determination that foreshadows Leoš Janáček's remarkable quartets. Certainly this feels more modern both in terms of sound and expressive range than the companion works. The Stenhammar Quartet again display marvellous engagement and play with a tonal range that tests their instruments to the limit but is ideal for this bi-polar music. Quite the relevance of the title Un Notturno nella Maniera di E.T.A. Hoffmann I do not know but neither does it seem terribly important. A stand-alone quartet work of less than fifteen minutes duration is a relative rarity. What I find remarkable is just how much Rangström crams into this time-frame. I could imagine some finding the lurching between ecstatic energy and frozen stillness too extreme in such a short span but I am amazed by the range of emotion and effect. As well as the already mentioned Janáček there are pre-echoes of Shostakovich [tr. 8 9:10] where heavy folk-like dances hammer out over implacable grinding bass arpeggiations. The immediate dissolution into a muted chorale motif which in turn suddenly becomes a driving fugal passage before fading into misty silence is just bizarre - but I love it. The young Rangström was advised by Carl Nielsen to write for quartet as useful technical practice. With regard to this work Nielsen wrote, "I feel that the vivacity and temperament that imbues your quartet is truly enchanting ... maybe we once can discuss the question of chamber music's style, goal, and limitations [my italics]". So perhaps even the older composer felt the content risked overwhelming the form. Much as I enjoyed the Atterberg quartets, this work is the reason to hear this disc. A remarkable, imaginative and powerful piece of music with my only sorrow that it did not mark the start of an extended group of quartet works by this composer - perhaps reflecting a little more of the control Nielsen recommends. Again I have nothing but praise for this performance. All in all this is another CPO triumph. Quite why it was kept in the recording vaults for five years I do not know. Perhaps the engineering is a tad close - but to my ear this adds to the Expressionist wildness of Rangström's work. Certainly the playing can stand such close attention throughout. An interesting liner seals the deal. An important and valuable addition to the catalogue of Scandinavian String Quartet music.